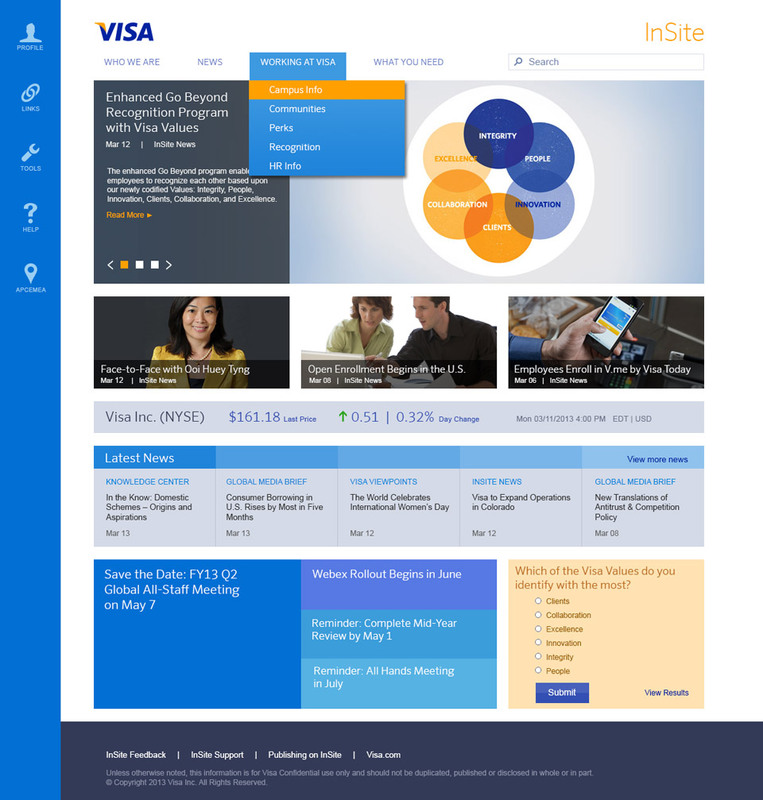 Designing Visa’s corporate intranet platform and content management system. 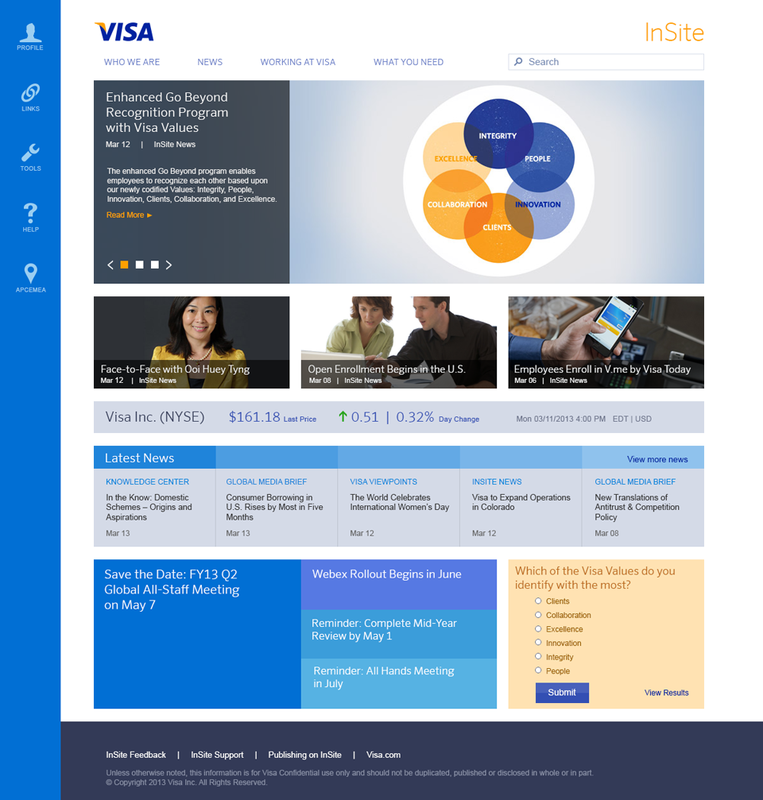 Visa’s Corporate Communications team needed to replace InSite, their aging intranet portal, with a new platform that would be the primary communications channel for 8,000 employees across the organization. InSite 2.0 would allow for increased employment engagement and productivity by delivering more relevant content, allow for peer-to-peer communication and provide a channel for Visa employees to connect with management. 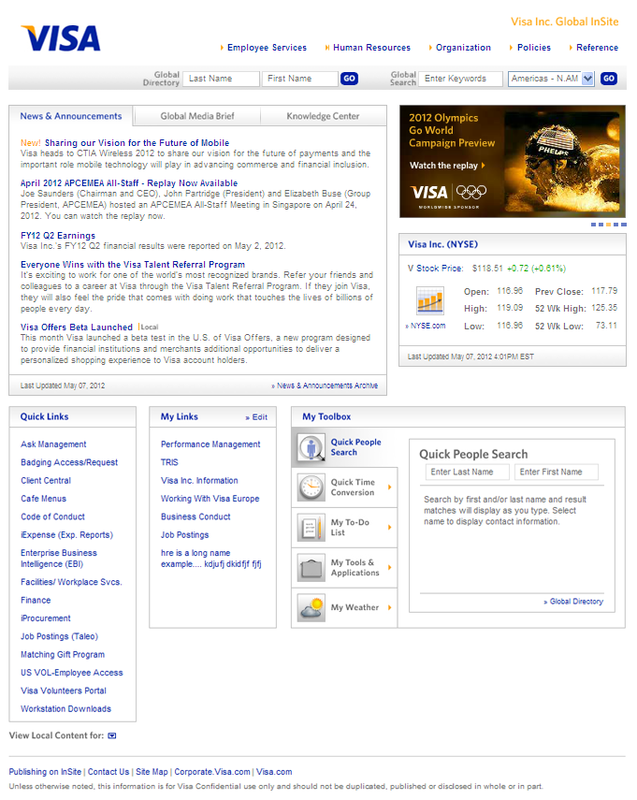 Previous version of Visa's intranet before the redesign. Current context. 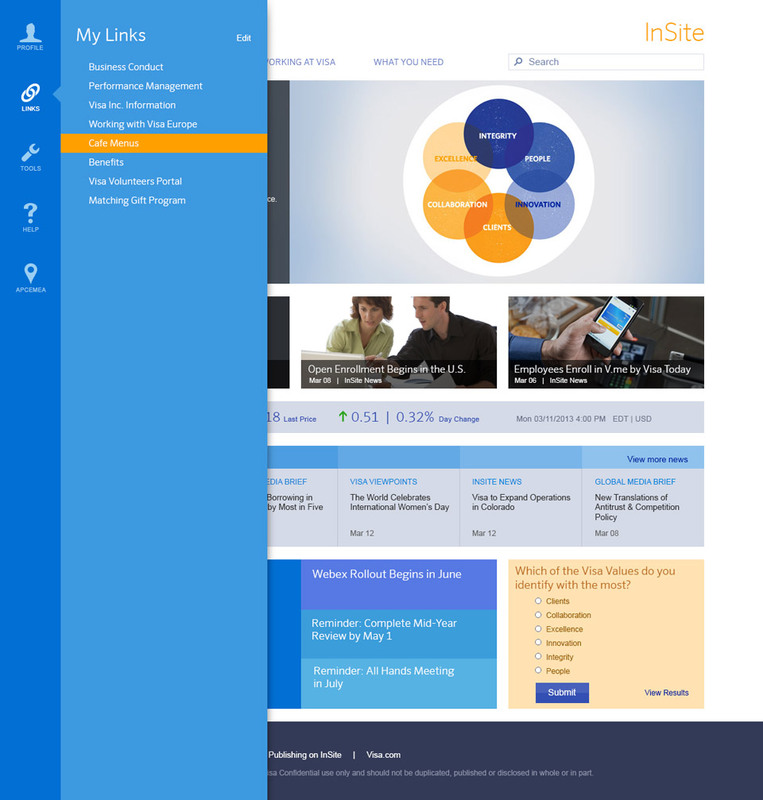 How employees use the intranet today and how it fits into their jobs and goals today. Domain Knowledge. What types of knowledge, experience, or training do employees need to be successful at their jobs. Goals and Motivations. What are employees trying to accomplish, how they are motivated, and how the new intranet help them accomplish their goals. Current Task and Activities. 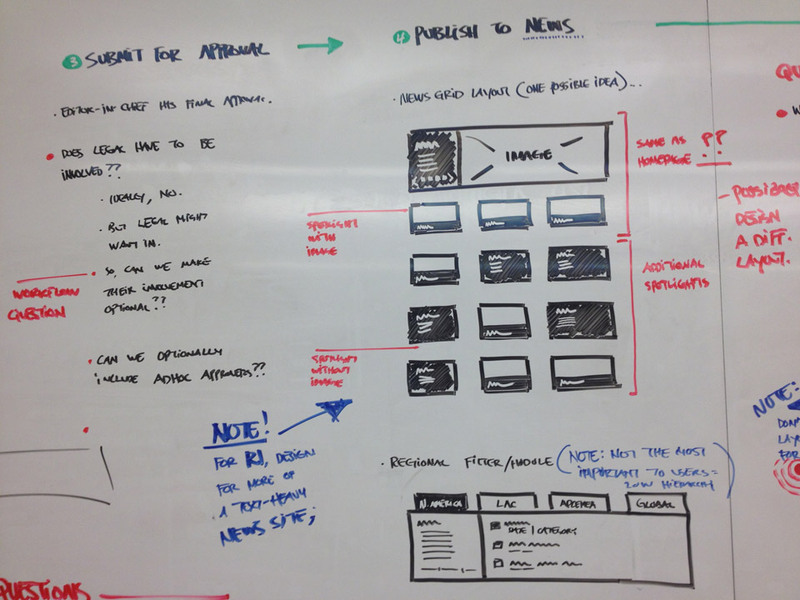 How the intranet helps to accomplish their tasks today and how it fails. Pain Points. What employees find frustrating. Future State Ideas. 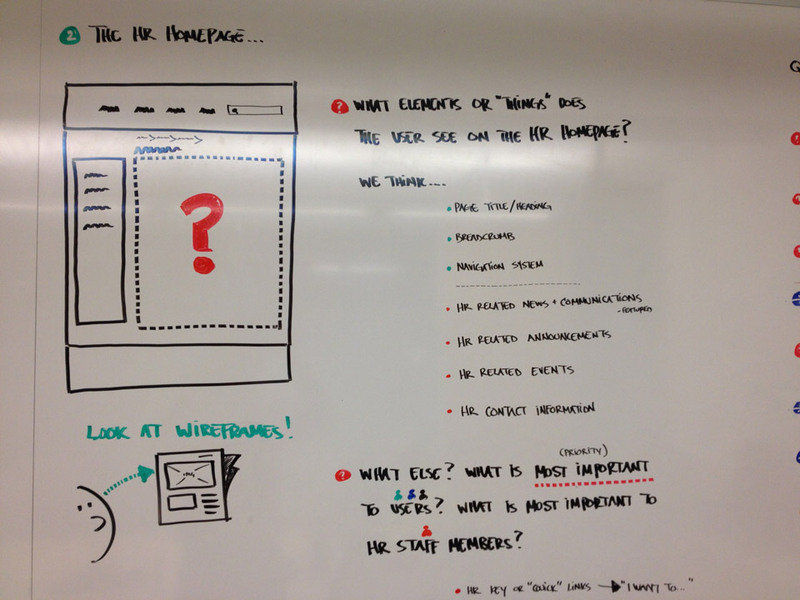 What expectations users have about the future state of the new intranet. 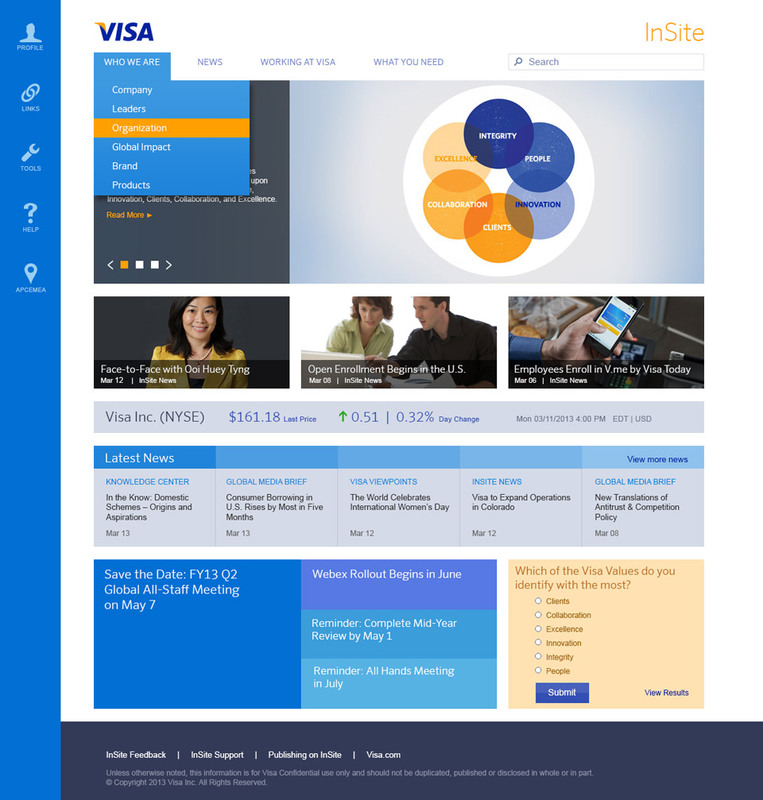 Visa’s intranet content was organized by departmental ownership. 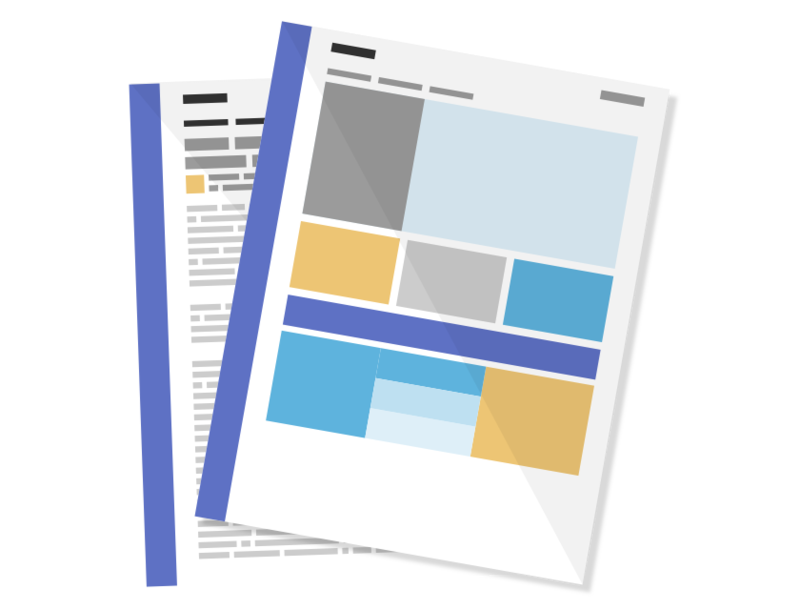 While this proved to be easy method for content authors to manage sites and pages, it wasn’t an intuitive model for employees to find what they were looking for. I lead and conducted ten open card-sort sessions with various focus groups of 4-8 employees based on our user personas and developed a task-based model for the entire site based on the patterns and findings from the IA sessions. 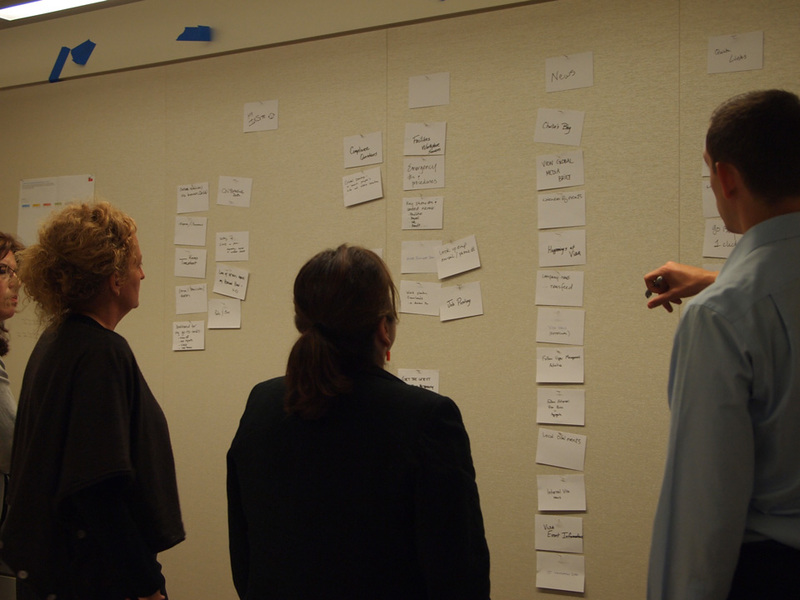 Visa employees participating in an open card sorting session for the Intranet redesign. 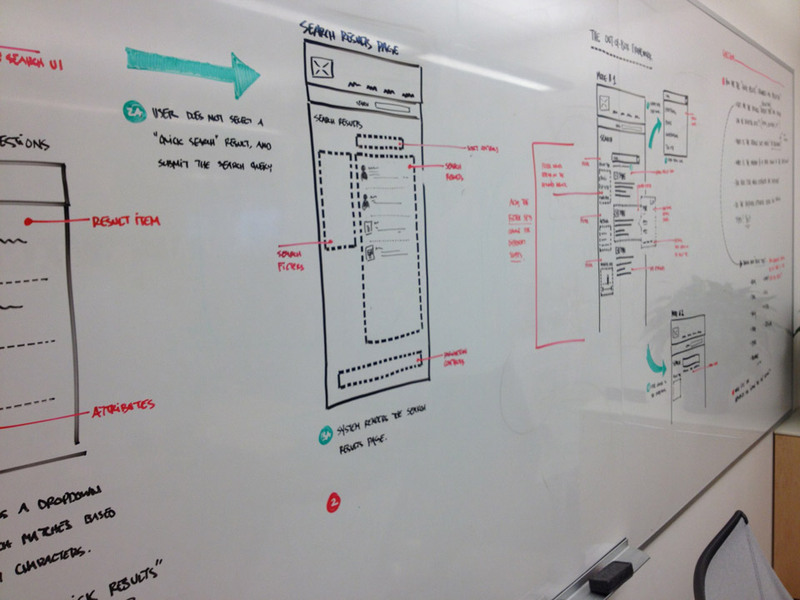 During the iterative design phases of the project, I setup a twice-weekly recurring series of design sessions with both stakeholders and project team members. 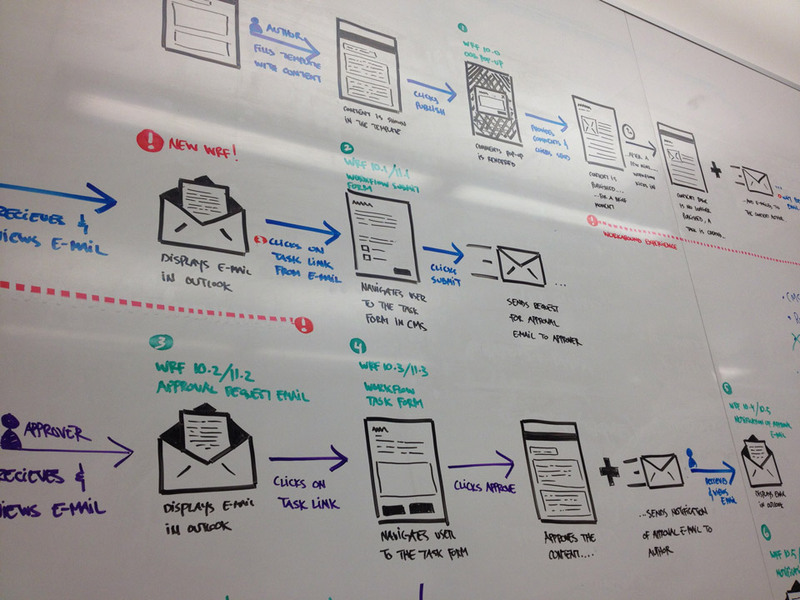 Given the tight project timeline, I wanted to create opportunities for active collaboration amongst cross-functional team members and stakeholders, while allowing the design team to regularly present and share iterations of their design artifacts such as site maps, wireframes, and visual design mockups. Each three-hour design session centered around whiteboards that I prepared prior the session. 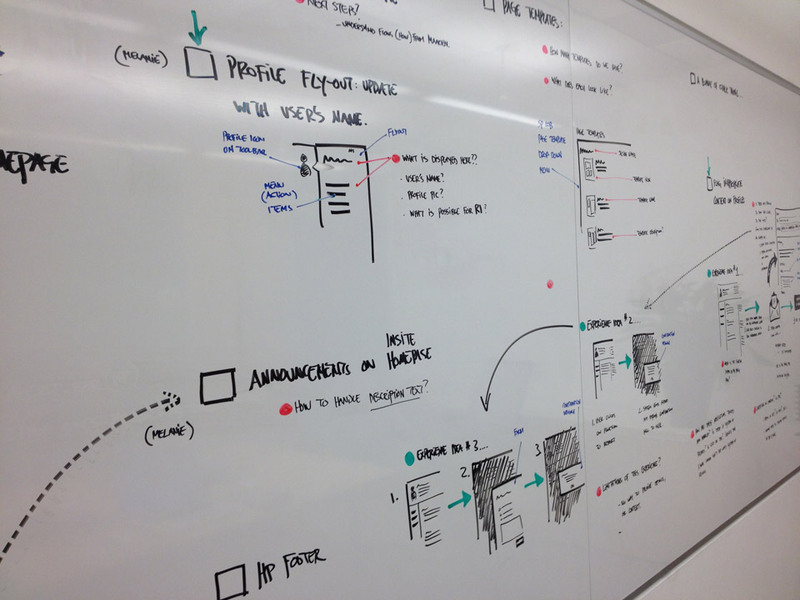 I met with my design team to determine the agenda and topics for the session, then prepared the boards with illustrations and UI layouts up for discussed during the meeting. Open questions and assumptions from either the design or technical teams were also captured and addressed collaboratively. 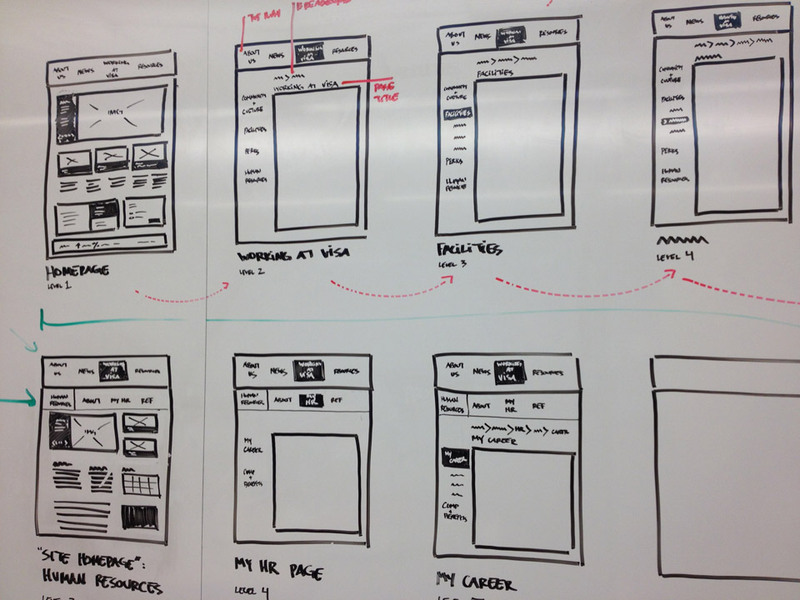 Whiteboards prepared for facilitated design session at Visa, Inc.
My team and I delivered lo-fidelity wireframes that captured interaction design details and functional requirements for every interface we designed. I worked with the interaction designers on the team and provide the initial conceptual design for each interface and then continued to work with the team to iterate and refine the designs. Regular facilitated reviews with both stakeholders and developers ensured that our wireframes and specifications met the requirements and were technically feasible. 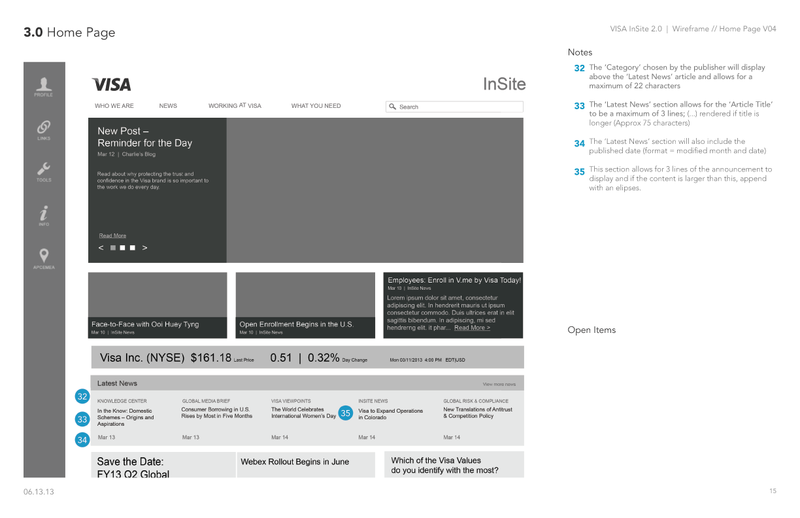 Lo-fidelty wireframe created for the InSite Homepage. 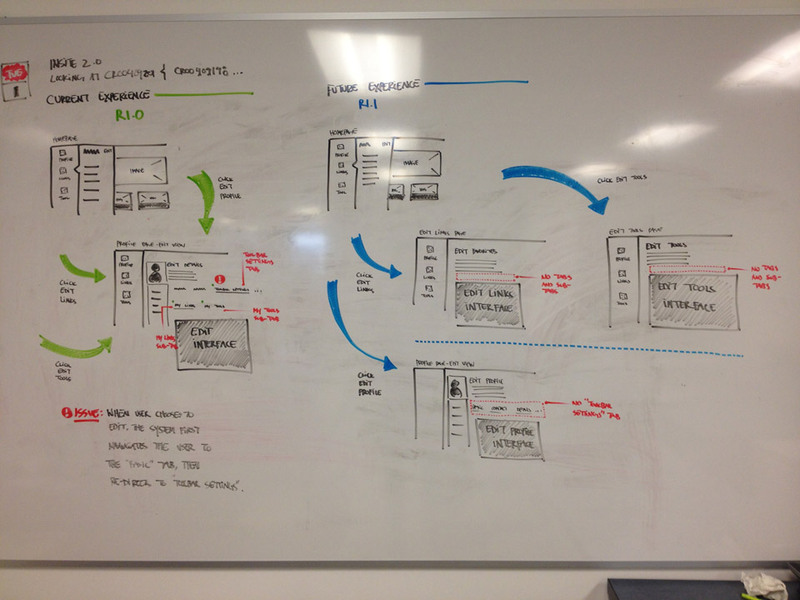 In parallel to managing the interaction designers on the team, I also worked directly with our visual designer to develop a visual style and detailed designs based on the concepts and functionality expressed in the wireframes. We successfully delivered the new intranet on time and within budget that addressed the needs of both the stakeholders and Visa employees. 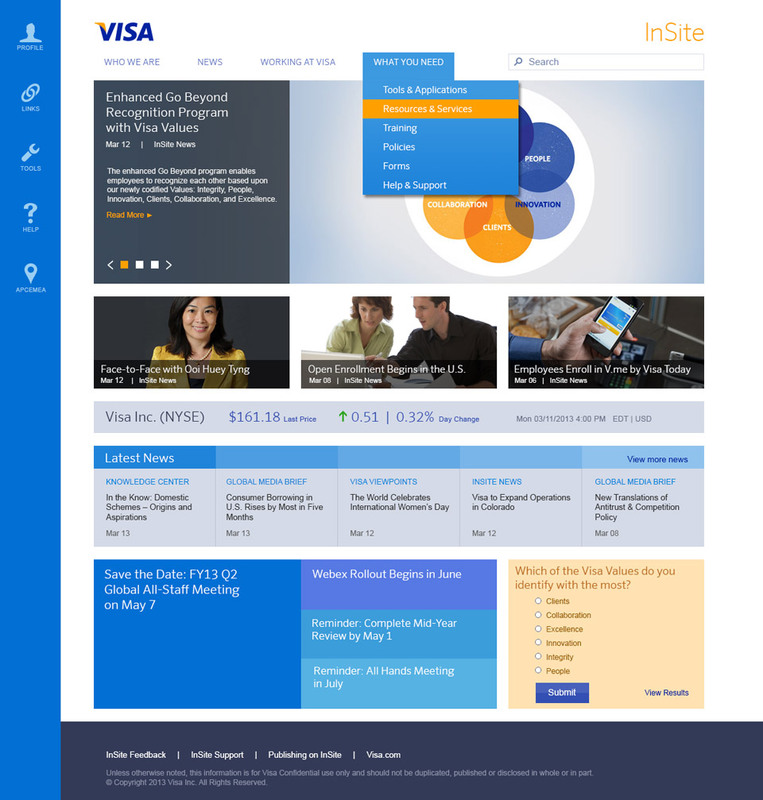 Visa’s new intranet consists of a new task-based information architecture, a homepage layout that puts emphasis on targeted content based on the employee’s location, the ability for users to personalize their tools and links and social features allowing employees to engage in peer-to-peer communication.